Online or via pickup, we provide organic, eco-friendly, and chemical-free products, plus items to beautify your home and spirit. As a small volunteer-run nonprofit, we can't compete with the pricing at large stores. However, having no paid staff allows all our net proceeds to fund cancer research and treatment for working dogs. Sit, stay & shop for what truly matters — health, home, happiness and healing. In 1987 Master Woodcarver, Michael Park, opened his own carving studio in Pennsylvania. The special ingredient that Michael instills in all of his work is his love of dogs. So, there, he carves among the company of his four dogs and a team of craftspeople to create beautiful renditions of countless breeds. Michael's versatility in a variety of woods, including basswood and mahogany, allows his carvings to be intergraded into furniture creating a useable art form. Each piece from Michael Park's studio line is hand-crafted one at a time. With painstaking care and detail, the finished products have a charm all their own. Hand painted and finished, they truly make one-of-a-kind collectibles. Whether obtained as a gift, functional art form, or striking conversation piece, a Michael Park carving will bring warmth to one's home, office or outdoor activities, for generations to come. IMPORTANT NOTE: Unless otherwise noted, please allow 2-3 weeks for delivery as the items below are handmade to order. At Xmas time, please allow for 4 weeks delivery time. Be sure to click on the images on the left to see larger, more detailed product photos. 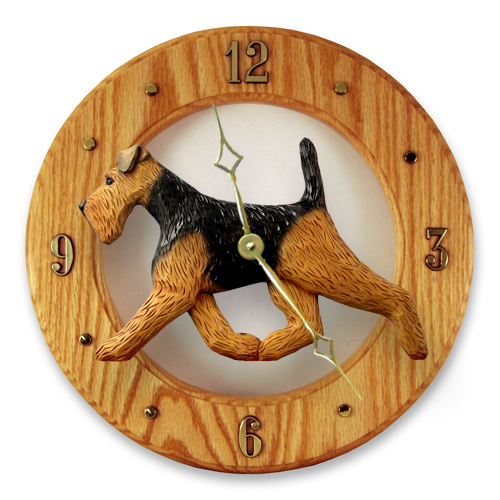 This beautifully hand crafted solid oak dog breed wall clock features a 2-dimensional resin reproduction of an original wood carving from Master Woodcarver Michael Park. It is accented with gold-plated numerals and hands. The reliable Quartz movement requires a single AA battery (not included). This piece is simply perfect for displaying in the kitchen, living room or den. It is available in light or dark oak (which is shown in the photo). The clock measures 12 3/4" in diameter X 3/4". $111 each. Cast from an original wood carving. Measures 11 1/2" in length. Hanger included. 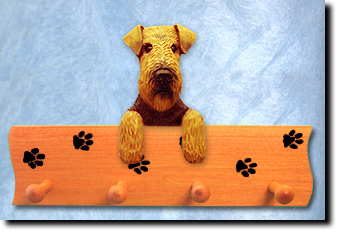 Sits on shelf or mantle or hung as a wall decoration. Hand painted. Made in the USA. $40 each. 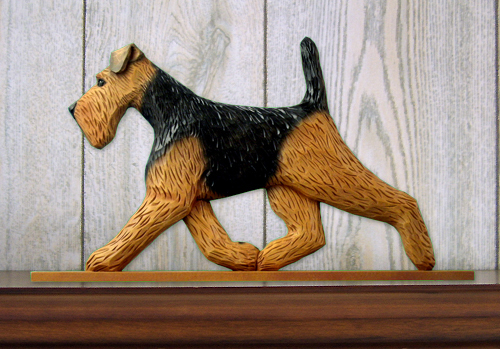 Resin dog reproduction mounted on a solid oak sign. Dog measures 11 1/2" in length. Sign measures 4 1/2" x 15".Hand painted. Made in the USA. $64 each. 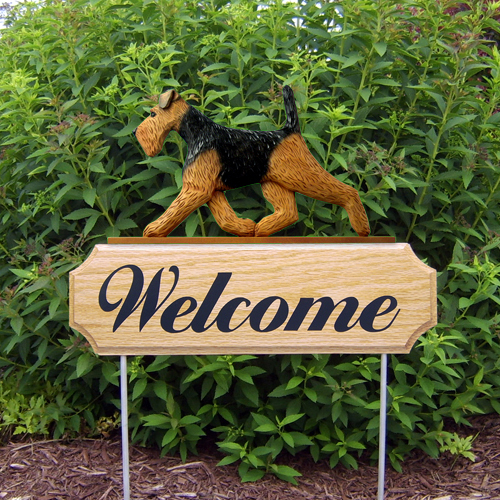 Resin dog reproduction mounted on a solid oak sign. Dog measures 11 1/2" in length. Sign measures 4 1/2" x 15". Two aluminum rods measure 1/4" x 16" each in length. Suitable for outside display. Hand painted. Made in the USA. $72 each. 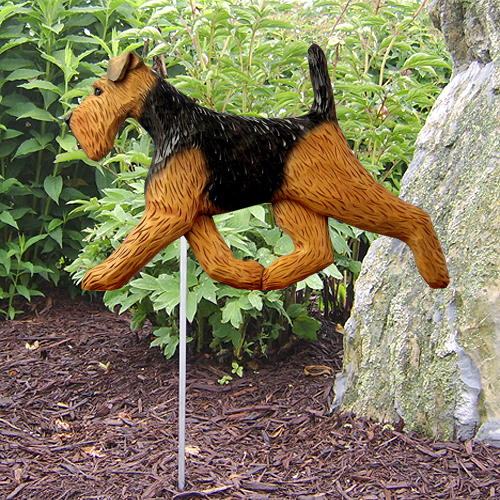 Two-dimensional resin dog breed mounted on an aluminum rod. For display in garden, flower bed or any area of landscaping. Dog measures approx. 11 1/2" in length. Stake is 1/4" x 16". Hand painted. Made in the USA. $44 each. 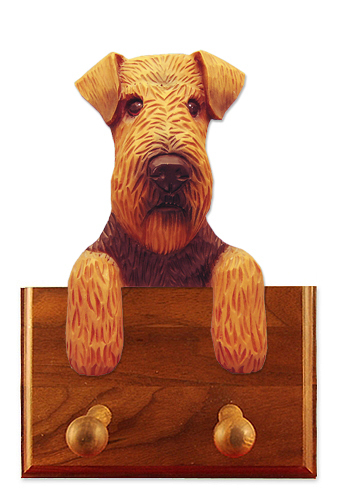 This custom wooden hand carved weathervane is a majestic work of art by Master Woodcarver Michael Park. 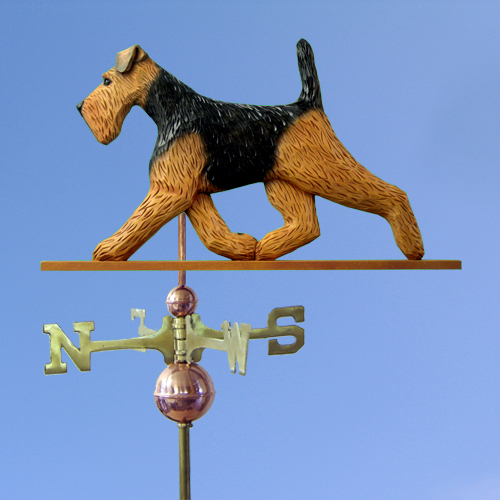 This wind vane is a fully functioning, weather resistant weathervane. 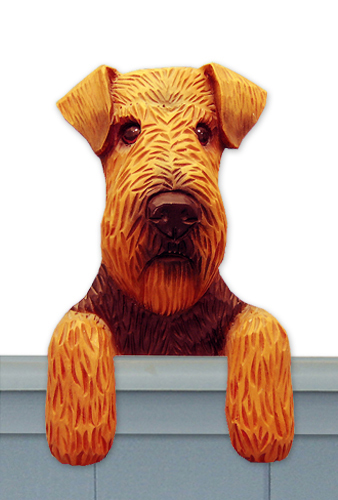 The weathervane is hand-carved from Basswood on both sides, sealed and hand-painted. A durable top finish insures vibrant colors for years to come. This purchase also includes the copper spacer balls, a rod, the directionals and ring. Figure Dimensions: Approx. 32"L X 18"H or 22"L x 18"H (Slight variation on dimensions will depend upon breed.) Add approx. 10" to dimension height for directionals and spacer balls. Directional Dimensions: 18" with 3" lettering. Roof mounts and indoor stands sold separately. Availability: Generally ships within 6 weeks. Made in the USA. $540 for 22" size and $695 for 32" size. Cute head and paws cast from an original woodcarving. Perfect for sitting on frames, shelves, mantles, etc. Heads average Approximately 6 ½ inches high. $36 each. Door Topper head mounted on 4 inch x 15 inch wooden sign with four 3 inch shaker pegs. Holds 1 or 2 heads. Mix or match breeds. $59 each with 1 dog and $93 with 2 dogs. Door topper head mounted on a 5 inches x 7 inches solid walnut plaque with 2 to 3 inch shaker pegs. $52 each.